This topic contains 2 replies, has 1 voice, and was last updated by Erjohn 3 years, 3 months ago. Anyone with a mac that their safari has been hijacked by “macprotectalert.com” – having a heck of a time in ridding this vicious malware! Many thanks for any kind of feedback. 1. First, please disconnect your Internet connection. 2. Go to Apple menu then choose Force Quit. 3. Select and close Safari program from the list. 4. When Safari is not running anymore, re-launch it while holding down on the Shift key. This method will run Safari in Safe Mode. 5. From there, macprotectalert.com may stop working and you can now remove it. 6. 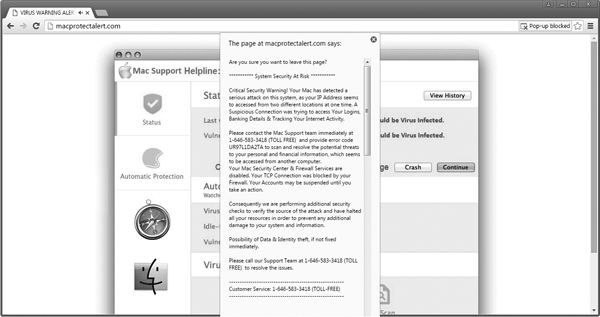 You may now see those dubious Tabs created by macprotectalert.com. Be sure to close all malicious tabs before going online. Please restart Safari so that you may now be able to use it normally.